The wait is over and Battery 4 doesn't disappoint. Ace for newbies and pros, it truly inspires creativity. GUI overhaul thoroughly welcome and now much more intuitive. Tagged content makes constructing kits faster. Effects and sample playback options refined. Battery began life at a time when Native Instruments didn't really deal in bundles but rather in dedicated software applications, each of which performing an independent task. It's been over a decade since Battery first appeared as a plug-in but, more tellingly, more than six years since Battery 3 was unveiled. While there have been some solid tweaks since, there's been nothing significant enough to warrant the release of a new version. "Does a company of this size need two dedicated drum engines? Delightfully, the answer is yes"
Battery fans feared the worst when Native Instruments debuted Maschine in 2009. After all, does a company of this size need two dedicated drum engines? Delightfully, the answer is yes. 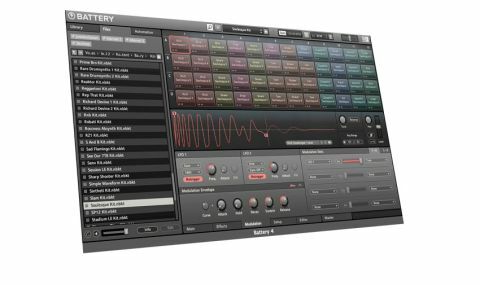 Now, Battery 4 has been released as a flagship new application within Komplete 9. Of course it's available separately from that bundle, but with the landscape for virtual drum machines having changed so dramatically does Battery still rule the roost? From a design point of view, there's no getting around the fact that Battery 3 has been showing its age for some time. Although its cell based matrix of drum pads remains a great approach to beat programming and sound triggering, the grey and green combination was never our favourite. Indeed, while colour-coding of pads was possible there was little continuity from one kit to the next. The only way to track down sounds was either to audition them or to squint hard at the interface. Battery 4 addresses this head-on with a much better design. Without a trace of light grey or green, the layout is now a slicker, darker affair. Colour coding is more straight-forward too, with preset kits now mostly showing kicks in red, snares in yellow, claps in pink, hats in light blue and so on. Below the matrix of pads in the upper surface, the middle of the GUI is dominated by the waveform display whose waveshapes match the colour of the pad you've selected for editing. Neatly, key parameters such as Tuning, Key Range, instant Reverse, Pan, Volume, Phase invert and L-R switching are available to the right. Mercifully, start and End flags on the waveform itself make selecting the active area of any sample straightforward. The lower part of the GUI concerns basic modulation possibilities, starting with Volume and Pitch Envelopes for each pad that feature two different Envelope configurations for each. Velocity can be mapped to Volume or Pitch (or both), while a simple 'dual' filter design lets you scoop out bass and treble from either end of the frequency spectrum at the same time. Each pad features its own Compressor that keeps things simple on this main page with a basic Amount dial only, while send dials to the Delay and Reverb modules (we'll come to these shortly) lie on the right. Overall this makes Battery 4's workflow quicker, though the best development on this front comes from a new tagging system for individual sounds within the plug-in's library. Building your own kits used to involve a lot of faff but now Battery 4 contains kit piece names that are further sub-categorised (acoustic, analog, electronic) so that you can audition via Battery's own browser to drag and drop hits into the cells you want them to fit. Once you've exhausted these initial sound sculpting tools, you can go under the hood of your cells and overall kit configuration via a series of tabs at the bottom. The Effects tab opens up more per-cell sonic treatments with Saturation, Lo-Fi, Filter/EQ and Transient Designing modules, as well as a complete set of controls for the Compressor module mentioned earlier. Further to the right, the Master tab allows access to sub-grouping Busses, the Reverb and Delay master modules, as well as Global Filter/EQ, Compressor, Limiter, Transient Designer and Saturation modules. The Modulation tab offers multiple opportunities to 'interrupt' signal flow with twin LFOs and a dedicated Modulation envelope, and drop down menus let you assign these to the parameters of your choice. Brilliantly, the waveform display toggles from LFO or Envelope shapes and the waveform of the sound you're processing as you hover over parameters, which is neat and hugely effective. Even though this version has been a long time coming, it's been worth the wait. Design wise, we're happy to leave the old version's looks firmly in the past. Workflow has been so significantly improved that once you have familiarized yourself with what's new, beat building becomes more fun than ever. The new kits sound great and with the integration options - Battery 4 will accept samples from a wide range of file types - there's no need to stick with NI's own libraries of content because you can so easily expand these with your own. Once you have configured sounds into cells, the giant strides NI have taken in terms of effects processing in recent years make their presence felt here too. Certainly, I would have no hesitation in recommending Battery 4. In fact, it should be considered towards the very top of your list if you're looking for a software only drum plug-in.